Large egg-shape representing creation and/or re-birth with an indentation in each side which surrounds a hole that carries light through the form. Smooth finish on all surfaces. Material bronze-lost wax cast. Patina black. Wax finish. Egg shape is an elongated ellipse and is slightly compressed on two sides. The sculpture is dedicated to Roma Grossynger Meissmer and Roseanne Deutscb. 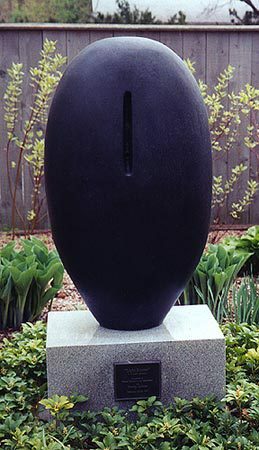 : Joe Ann Cousino, “Light Source,” Ohio Outdoor Sculpture Inventory, accessed April 20, 2019, http://oosi.sculpturecenter.org/items/show/1089.